on every continent except Antarctica. World-renowned artist and Johannesburg resident William Kentridge has received the 2010 Kyoto Prize for Arts and Philosophy, for his insights and reflections on human nature through his work. Known as much for his stage designs and hand-drawn animated films as for his artwork, Kentridge is the first African to receive the award, now in its 26th year. Considered the Japanese equivalent of the Nobel Prizes, the Kyoto Prize was established by philanthropist and entrepreneur Kazuo Inamori, founder of the Kyocera Corporation. 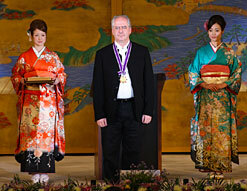 The ceremony takes place in Kyoto, and only three prizes are given each year. The other two categories are Advanced Technology and Basic Sciences and this year’s laureates are Japanese medical scientist and stem cell expert Dr Shinya Yamanaka, and pioneering Hungarian-born mathematician Dr László Lovász, now living in the US. The three will come together in early April 2010 for the 10th annual Kyoto Prize Symposium in San Diego, California. Winners receive 50-million yen (approximately US$610 000), a diploma and a medal cast in 20-carat gold. Kentridge joins a distinguished group of arts and philosophy recipients that includes French conductor Pierre Boulez, Japanese designer Issey Miyake, Austrian conductor Nikolaus Harnoncourt, and American artist Roy Lichtenstein. The artist told Eyewitness News that the year had been remarkable for South Africa as a whole and that this award had made him a more proud to be a citizen. “Using a simple technique that he himself calls ‘stone-age filmmaking’ – namely, the laborious process of filming, frame by frame, a series of ceaselessly changing charcoal and pastel drawings – Mr Kentridge has injected the traditional technique of drawing into diverse media, including animation, video projection and stage set design,” said the citation on the Kyoto Prize website. Although Kentridge’s works focus on South Africa, their insight and reflection on the nature of human existence have lent them a universal appeal. It was felt that his work, “full of sharp intelligence and profound poetry”, continues to exert “great influence” on other artists, giving people worldwide “courage and hope that their attempts and practices may still be effective and fundamental, even amid the stagnation of our contemporary society, swirling with political and social unrest”. The prize was initiated in 1985 and is administered by the non-profit Inamori Foundation, which was established in 1984 by Inamori. He believed that “a human being has no higher calling than to strive for the greater good of society, and that the future of humanity can be assured only when there is a balance between our scientific progress and our spiritual depth”. So far the prize has been awarded to 84 people and one foundation, from 15 different countries. Laureates range from scientists, engineers and researchers to philosophers, painters, architects, sculptors, musicians and film directors. The US has produced the most number of recipients at 34, followed by Japan with 14, the UK with 12, and France with 8.